Hundreds of protesters rallied in Cairo's downtown on Monday in solidarity with jailed activists Ahmed Douma, Mohamed Adel and Ahmed Maher. They also voiced support for other political detainees such as Alaa Abdel-Fattah and demanded the repeal of the protest law. Protesters gathered at the Cairo Opera House on Monday before marching to the journalists syndicate while chanting anti-military, anti-police and pro-revolutionary slogans, and calling for the detainees' release. The rally was organised by Way of the Revolution Front, which includes leading members of the April 6 Youth Movement, Strong Egypt Party, the Revolutionary Socialists and the Justice and Freedom Youth. April 6 Youth Movement leading members Maher and Adel, and Douma, a prominent revolutionary activist, were recently jailed for three years and fined LE50,000 for organising unauthorised protests and attacking the security forces. "The protest law is against the January 25 Revolution and its activists, it should be suspended," Dr Nashwa, an independent protester, told Ahram Online. "The protest law hasn't stopped protests – in fact they are spreading," Dr Hatem Taliemah of the Revolutionary Socialists said. The security crackdown on activists will be intensified before the third anniversary of the January 2011 uprising, Taliemah predicted. 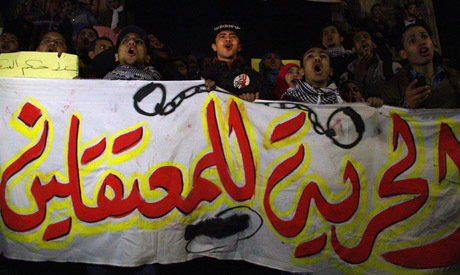 April 6 Youth Movement members said the movement would escalate its protests until all the detainees are released. Those who supported illegitimate removal of Mursi and brutal crackdown on its supporters will soon face the same fate.